or a gas piston for automatically indexing the cylinder and must be provided with a recoil system, firing device, and feeder. The particular mechanism shown in fig. 4-6 is taken from the Clarke patent previously mentioned in this chapter. This is a gas-operated weapon and the illustration shows all of the principal parts except for the recoil system and extractor. Fig. 4-6A shows the condition of the mechanism immediately after firing and fig. 4-6B shows the condition with the piston slide driven fullv to the rear. the projectile passes the gas port in the barrel, the powder gases flow into the gas cylinder and exert a rearward thrust on the gas piston. The time at which this occurs will depend on the location of the port and ordinarily will be from 0.001 to 0.002 second after ignition of the propcllant charge. The piston action and the cylinder rotating cam groove in the piston slide are controlled in the design so that the cylinder is not rotated immediately but rotation is delayed until the pressure in the barrel has dropped to a safe operating limit a few milliseconds after the projectile has left the muzzle. As the piston slide moves to the rear, the cam follower in the cylinder rotating cam groove is driven to the right, causing the operating hand to engage the ratchet on the cylinder and to rotate the cylinder. The hand rotates the cylinder sufficiently to bring the next loaded chamber into alignment with the barrel. The rearward movement of the piston slide also extracts the empty case from the fired chamber and causcs the belt feed cam to move the belt feed slide so as to position a fresh cartridge in front of the rammer. As the piston slide moves forward again (fig. 4 -6C), the rammer pushes the cartridge out of the belt into the empty chambcr now at the zero-degree position. At the same time, the belt feed slide is retracted and the ratchet operating hand is moved back to pick up the next notch in the operating ratchet on the cylinder. This completes the operating cycle and the next cycle starts when the round now in the 180-degree position is fired. flat array is wasteful of space and awkward. Also, the overall shape and balance of the weapon changes as the chamber plate slides laterally during firing. Of even greater importance is the fact that, to fire a continuous burst of any great duration, the motion of the plate must be reversed during firing. This means that immediately after the reversal, the next chamber to come into line is the same one which was fired just an instant before. A condition of this sort obviously makes it practically impossible to fire continuously at a high rate. The rotating cylinder eliminates all of the disadvantages of the harmonica gun. The mechanism is compact and relatively easy to control. The shape of the weapon remains symmetrical throughout its-operation and the balance remains practically unchanged. The most significant advantage is that the cylindrical arrangement of the chambers gives what is in effect, an endless succcssion of chambers because after a chamber is fired, there is time available for extraction and reloading while the other chambers are being fired. Although the revolver is very simple from the functional point of view, there are a number of problems conncctcd with the design of revolver cannon which have defied complete solution for over 80 years. In revolver hand guns, all of which use comparatively low-powered ammunition and are fired slowly, these problems cither do not exist to anv serious extent or have been overcome ade-quatcly through good design and careful manufacture. 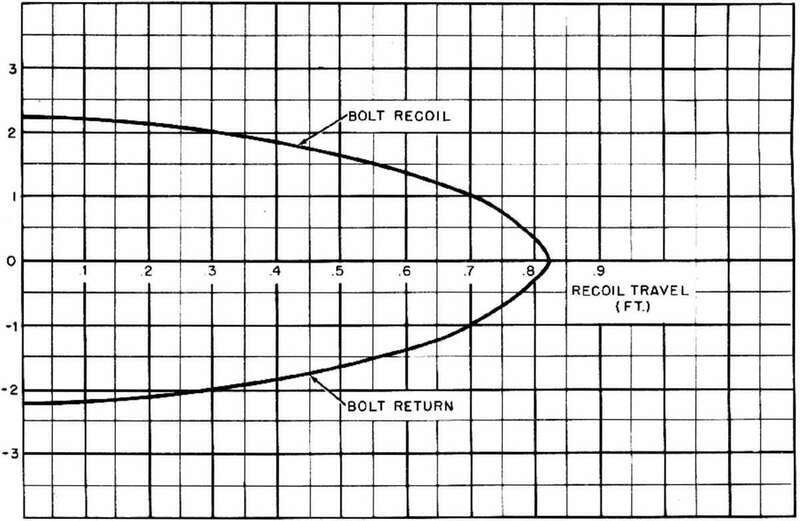 Nevertheless, the operating conditions in high-powered, high-rate-of-firc revolver cannon are so radically different that expedients that have been fairly successful in hand guns fail completely when applied in aircraft cannon.